This is the first time in the 11-year history of the School Lunch Report Card that a school district received a perfect score of 100. Pinellas County Schools has improved its grade each time it appeared on the report card: B (86) in 2003, A- (92) in 2006, A (94) in 2007, and A (98) in 2008. Pinellas’ high score reflects its varied menu, which boasts many healthful low-fat vegetarian entrées five days a week, including vegetarian chili, pasta fagioli, and a Southwest salad. The district also serves a hot low-fat vegetable side dish such as steamed peas or sweet potatoes sticks and an entrée salad every day, along with a selection of assorted fresh fruit. Students are allowed to select as many fruits and vegetables as they like with each meal. Pinellas also reduced the price of à la carte fruits and vegetables by 50 percent. Within the first six months of the school year, the county saw a more than 30 percent increase in the amount spent on fresh produce. Students can select 100 percent juice or water for free instead of milk. Nutrition education initiatives at Pinellas include a “Featured Fruit or Vegetable of the Month.” Produce recently highlighted includes avocados, pomegranates, and purple sweet potatoes. Recipes and educational and marketing materials support the featured produce. Pinellas also supports district-wide school gardens. More than $25,000 in grant funds assisted 65 schools with equipment and supplies to sustain or start gardens. In its first appearance on the School Lunch Report Card, the Howard County Public School System ties for second place. Vegetarian options are available each day to the 20,000 Howard County students, as are fresh fruit and low-fat vegetable side dishes such as steamed carrot coins and steamed spinach. Each September, many of the school system’s fruits and vegetables come from its farm-to-school program. Lunch menus also offer tips such as “USDA’s 10 Tips to Help You Eat Whole Grains.” Nondairy beverages are available each day at no cost. Innovative nutrition programs include a contest for middle and high school students in the Culinary Arts section of the Family and Consumer Science Program to develop recipes that meet USDA standards. Howard County could improve its grade by offering vegan entrées more often and removing unhealthful items such as beef tacos and macaroni and cheese from the menu. Knox County Schools ties for second place in its first year on the School Lunch Report Card. Vegetarian and vegan entrées such as pasta with marina sauce and peanut butter and jelly sandwiches are served daily. Creative vegan options including tofu wings, hummus, tofu pad thai, and vegan burgers will soon be available to Knox County’s nearly 60,000 students. A choice of up to three daily low-fat vegetable side dishes includes a side salad made from spring mix or romaine lettuce and fresh baby carrots. Three to five servings of fresh fruit are offered daily. Knox County Schools has participated in a farm-to-school program since 2011 and implemented the Chefs Move to Schools program in October 2012. Knox County has 14 USDA Fresh Fruit and Vegetable program schools and is expanding its Breakfast in the Classroom program to up to 22 schools by October 2013. Removing processed meats such as corn dog nuggets and a ham and cheese croissant from the menu could improve Knox County’s grade. Omaha Public Schools, which serves more than 50,000 students, inched up from an A to an A+ this year. Students have the option of choosing a vegetarian or vegan option each day, and all vegetarian items are clearly marked on the lunch menu. Vegan options include a peanut butter or soy butter and jelly sandwich and chips with black bean salsa. Fresh fruit is available daily, as is fruit juice at no extra cost to students. Omaha also offers fresh fruit and low-fat vegetable side dishes such as steamed vegetables daily. Omaha lunch menus provide nutrition education on topics such as the benefits of vegetables. Students in many schools have the opportunity to participate in a culinary arts program. Omaha participates in a farm-to-school program and some schools have gardens. Despite its most improved status on the 2008 School Lunch Report Card—rising from a D (66) in 2007 to an A (96) in 2008, Omaha still has room for improvement. The district continues to serve entrées high in fat and cholesterol, including a ham and cheese sandwiches, hot dogs, and a beef cutlet. Atlanta Public Schools earns an A on this year’s School Lunch Report Card, after receiving a D+ (67) in 2007. In 2007, PCRM recommended that the district offer more low-fat vegetarian options and fresh fruit to help improve its grade. Vegetarian options are available five days per week and are clearly labeled. Low-fat vegan options are now available two days a week and include a garden vegetable wrap on a whole-wheat tortilla, garden vegetable salad with chickpeas, and whole-wheat vegetable pasta primavera. Low-fat vegetable side dishes such as collard greens and Asian vegetables are available daily, as is fresh fruit. Produce of the Month features local farmers and provides the economical and health benefits of locally grown produce. Atlanta Public Schools has five school gardens. And the Student Wellness Ambassadors Program promotes health and wellness of students through peer mentoring and education. The district’s Smoothie Dream is a middle school classroom activity that provides nutrition and cooking instruction. Making a vegan entrée available daily and eliminating processed meat items such as pepperoni pizza could help Atlanta improve its grade. In its fifth appearance on the School Lunch Report Card, Broward County continues to do an excellent job of adding healthful foods to its menus. Broward offers a healthful vegan entrée salad with sunflower seeds and legumes every day. Meatless Mondays were instituted in September. Bean-and-rice dishes are offered throughout the month and are available daily in high schools. A hot vegan item is offered weekly. Soymilk is available at no extra cost with a parental request. Two healthy vegetable side dishes are available at lunch five days a week and include steamed spinach and fresh zucchini. Two fruit options such as chilled peaches and chilled tropical fruit salad are also available with each lunch. Broward County participates in a farm-to-school program and many schools have vegetable gardens. Many Broward County schools participate in the USDA Fresh Fruit and Vegetable program. The program started in March 2012 with sweet peppers, radishes, sugar snap peas, blackberries, and kiwi as the featured foods for spring. Teachers are provided classroom materials to promote the featured produce. Broward County also coordinates a “plant power” themed poster contests each year. And 50 schools participate in a University of Florida program that includes six assemblies a year that promote healthy eating with fresh fruits and vegetables. Broward County received a B (85) 2002, a B (85) in 2003, a B+ (89) in 2006, and an A- (91) in 2008. Simply adding more vegan options could help Broward earn an A+. Although St. Louis Public Schools wasn’t on the last School Lunch Report Card, it deserves a “most improved” mention. When it last appeared on the report card in 2007, it earned an F (53). Since then, it’s made impressive strides in offering its more than 25,000 students healthful lunches. Vegetarian options are now available daily. Vegan options are available three days a week and include a black bean taco and a hummus and veggie pita. Healthy vegetable side dishes such as oven steamed butternut squash are available daily and fresh fruit is available three to five days a week. In addition to the low-fat, plant-based foods served in the cafeteria, St. Louis promotes healthful eating through nearly a dozen nutrition initiatives. The “flexitarian” campaign encourages students to eat plant-based meals once or twice a week. Schools also participate in a farm-to-school program. Last year schools served 60,000 pounds of locally grown produce including sweet potatoes and kale. St. Louis created a Chefs 2 Schools program modeled on the Chefs Move to Schools program that brings chefs to schools to create healthy meals that meet dietary guidelines. Chefs also teach students how to make healthy choices. In the past two years, there have been nearly 20 Chefs 2 Schools events. Other programs include 22 school gardens, 20 schools participating in the USDA Fresh Fruit and Vegetable program, and the Healthy Eating and Local Produce-St. Louis Public Schools grant that helps increase the amount of locally grown produce served to students. Serving vegan entrées and fresh fruit daily could help St. Louis improve its grade. Miami-Dade County Public Schools finally earned an A after receiving a B+ (89) in 2003, a B+ (88) in 2006, and a B+ (89) in 2007. Low-fat vegan entrées are now served almost daily and include a black bean and brown rice bowl, hummus with vegetables and whole-grain flatbread, Gardenburger, black bean burger, and baked potato with steamed broccoli. Food service managers include produce from several Miami-Dade County schools on menus. Miami-Dade County also participates in a farm-to-school program district-wide and in the USDA Fresh Fruit and Vegetable program in 52 schools. Minor adjustments, such as serving vegan entrées daily and providing nutrition education in the cafeteria or on menus, could improve Miami-Dade’s score. Another first-timer to the School Lunch Report Card, Long Beach Unified School District earns an A- for serving healthful vegetarian entrées five days a week. Low-fat vegetable side dishes, such as sweet potato bites and vegetarian beans, and fresh fruit are also served daily. Nutrition education initiatives include “Harvest of the Month” recipes and posters that promote eating a variety of fruits and vegetables. Some schools have gardens and others have worked with chefs to bring cooking demonstrations into classrooms. Long Beach could improve its grade by adding vegan entrées—none are currently available—and eliminating processed meats such as its corn dog and pepperoni pizza. Oakland Unified School District is on the School Lunch Report Card for the fourth time and receives its best grade, a B+, this year. Since 2008, Oakland has implemented Meatless Mondays and other initiatives to help students understand the benefits of healthful eating. Breakfast for Lunch Day features veggie sausage, and vegetarian entrées are available daily. Oakland participates in a farm-to-school program, and 58 of the district’s schools have gardens that are used for nutrition education. The district also partnered with the Alameda County Public Health department to create the Oakland Eats Garden Fresh campaign, which connects what students learn about fruits and vegetables in the classroom to the cafeteria. Oakland Fresh School Produce Markets are a network of 22 school produce markets throughout Oakland Unified School District that sell locally grown produce at public schools. Produce is sold by parents and students during afterschool hours every week at each school site. All school produce markets offer monthly vegetarian cooking demonstrations and tastings. Oakland could continue improving its grade by offering fresh fruits five days a week and by offering more cholesterol-free options. Oakland received a C (75) in 2006, a B (84) in 2007, and a C+ (79) in 2008. Washoe County School District improved its score by 22 points from the last School Lunch Report card—rising from a D (66) to a B+ (88). In 2008, Washoe served healthful vegetarian options about once a week, and it offered no nutrition education or innovative food programs. Now, vegetarian entrées are served three to four times a week and are clearly marked on the menu. The district also operates the USDA Fresh Fruit and Vegetable program in 34 schools, and some schools now have gardens. Washoe still has room for improvement by offering vegan options more frequently and eliminating high-fat, high-cholesterol options such as macaroni and cheese, a grilled cheese sandwich, and cheese pizza. Montgomery County Public Schools dropped the most points from the last PCRM School Lunch Report, sliding from an A to a B+. Healthful vegetarian options are available four days a week. Meatless items are clearly marked on the cafeteria menu, which frequently refers to vegan options. But cholesterol-free items are limited to a peanut butter and jelly sandwich and vegetable chili. Vegetable side dishes and fresh fruit are available five days a week. Salad bars are now offered as part of the reimbursable meal in many schools. And in more than 30 elementary schools, entrée salads are offered as a menu choice. Soymilk is available for purchase à la carte. Montgomery County employs a wellness specialist who provides information on vegan and vegetarian foods and instruction on preparing healthy meals and snacks. Focus groups are conducted in schools and students learn about menu options including vegan selections. The county also celebrates farm-to-school annually in September with a wide assortment of fruits and vegetables, and its website offers instructions on planning, implementing, caring for, and maintaining gardens. Nondairy beverages are available at no added cost to students purchasing a complete lunch; they can also be purchased à la carte. Montgomery County could improve its grade by making more vegan options available on the elementary school menu. Montgomery County is a longtime participant in the School Lunch Report Card and had previously steadily increased its score over the years. The district moved from a C+ (78) in 2003 to a C- (70.4) in 2004, a B (84) in 2006, a B+ (87) in 2007, and an A (98) in 2008. Dallas Independent School District earns a B—the same grade it earned on its last appearance on the School Lunch Report Card in 2006. Vegetarian entrées are available three to four times a week. Vegan entrées including a black bean burger, hummus with vegetables, and bean dippers are available one to two days a week. These options are highlighted on daily menu signage. Low-fat vegetable side dishes and fresh fruit are available five days a week. Juice and bottled water must be purchased à la carte. Monthly nutrition education promotions such as “Tasty Teasers” encourage students to try vegetarian options. Some Dallas schools have gardens, and the district is working with local vendors to offer more locally grown produce. Dallas could improve its grade by offering vegetarian and vegan entrées more frequently and by providing nondairy beverages at no extra cost to students. Until this year, Dallas improved its grade with each report card: D (65) in 2002, C+ (77) in 2003, and B (85) in 2006. Seminole County Public Schools squeaks by with a B- its first time on the School Lunch Report Card. It will have to make some improvements to catch up to the three Florida school districts that earn As on this year’s School Lunch Report Card. Low-fat vegetable side dishes are only available two to three days a week and there is no fresh fruit on the menu. The only vegetarian option, which is served each day, is a peanut butter and jelly sandwich. Seminole does make some effort to promote healthful eating among its 32,000 students. Salad bars are being installed throughout the district. Schools also promote fruits, vegetables, whole grains, and other “superfoods” with signage and handouts. And some cafeterias have conducted fruit and vegetable contests. Several schools also have gardens. In-school field trips allow students to visit the cafeteria to see how food is delivered and to participate preparing dishes made with fresh fruits and vegetables. Seminole could improve its grade with daily offering offerings of vegetable side dishes and fresh fruit. Additional points could be earned by offering a wider variety of vegetarian and vegan entrées and eliminating unhealthful items such as a barbecue sandwich, beef tacos, and processed meats including pepperoni. Anchorage School District, which serves lunch to nearly 50,000 students, maintains its C+ this year. Healthful vegetarian options are available each day upon request, though none are cholesterol-free and include items such as cheese pizza and macaroni and cheese. The district does offer at least one low-fat vegetable side dish such as Cowboy Confetti or fresh carrots daily, and fresh fruit is available three days a week. 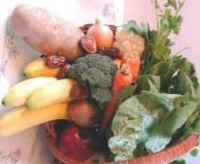 The monthly menu includes information on healthy eating, and promotes the benefits of fruits, vegetables, and legumes. Anchorage could improve its score by serving fresh fruit daily and adding vegan entrées to its menu. It should also replace processed meats such as pepperoni pizza and ham sandwiches with zero-cholesterol, low-fat vegetarian options. In its first appearance on the School Lunch Report Card in 2007, Anchorage earned an F (60). This is Guilford County Schools first year on the School Lunch Report Card. A menu loaded with processed meat such as hot dogs and pepperoni pizza and no cholesterol-free entrée options keeps Guilford County from scoring a B. Vegetarian options are served daily, but are loaded with cheese. Vegetable side dishes such as black bean and corn salsa are served daily, but fresh fruit is only available two times a week. Many Guilford County Schools have gardens and 13 schools participate in the USDA Fresh Fruit and Vegetable Program. The School District of Philadelphia earns a C for the mediocre lunches it serves to 155,000 students each school day. The district earns points for the healthful vegetable side dishes are fresh fruit it serves each day. Nondairy beverages are also available at no extra cost. The district loses points for serving vegetarian options only once or twice per week. None of those are cholesterol-free. The items that are on the menu leave room for improvement: processed meats such as ham and high-fat items including a Philly cheesesteak. Thirty-two schools participate in a farm-to-school program, and select schools participate in the USDA Fresh Fruit and Vegetable program. Some schools have gardens and cooking classes. Philadelphia earned an F (59) in 2002 and B- (80) in 2003. Burlington School District earns a D+ its first time on the School Lunch Report Card. Vegetarian entrées are only available one to two days a week. And although the menu includes several vegan side dishes, such as hummus, black bean and corn salad, and minestrone soup, it offers no vegan entrées. Burlington earns points for serving low-fat vegetable side dishes and fresh fruits five days a week. Nondairy beverages are available daily at no extra cost. Burlington’s cafeteria and menu do not offer education about the health benefits of a plant-based diet, but schools do offer innovative nutrition education programs, including gardens, cooking classes, and an orchard. Burlington was also chosen as a USDA model school in the Know Your Farmer, Know Your Food campaign. Burlington could improve its grade by offering vegan entrées and increasing frequency it serves vegetarian entrées. The 54,000 students who are served lunch in the Fresno Unified School District have few healthful options available to them. Vegetarian options are available one or two days of the week, but are loaded with cheese and include cheese sticks with marinara sauce, grilled cheese, macaroni and cheese, and a bean and cheese burrito. Red meat, such as a steak and cheese sandwich, teriyaki beef, beef taco chalupa, and Italian rotini with beef, is dominant on the menu. Despite these items, there are a few bright spots in Fresno Unified School District. Low-fat vegetable side dishes and fresh fruit are available five days a week. The district also participates in a farm-to-school program, fresh fruit and vegetable program, and other initiatives to promote healthful school meals. Fresno could improve its grade by offering vegetarian entrées more frequently and adding vegan entrées. This is Fresno’s first time on the School Lunch Report Card. Davis School District returns to the School Lunch Report card this year with a D+ after earning a C+ (77) in 2007. Although the district offers vegetable side dishes and fruit five days a week, vegetarian and vegan options are limited for its 33,000 students. In 2007, the School Lunch Report Card noted that Davis could improve its score substantially if it offered a nondairy beverage to all students, not just those who have a parent’s or doctor’s note. This has not changed. Davis could also improve its grade by serving vegetarian entrées daily and expanding its vegan options to include more than just a peanut butter and jelly sandwich. The district also loses points for lack of innovative nutrition education programs. It’s been a decade since the Houston Independent School District appeared on the School Lunch Report Card. Its grade has improved from the F (57) it received in 2002, but the district still doesn’t earn a passing grade. The more than 200,000 students who are served lunch in this district are hard-pressed to find something healthful to eat. The only vegetarian option available is cheese pizza. Typical fare includes beef taco nachos and chicken nuggets. Vegetable side dishes and nondairy beverages are available daily. Fresh fruit is only served twice a week. Approximately 20 percent of the produce the district purchases is locally grown, and there are more than 90 school gardens. Houston could improve its grade by offering fresh fruit daily and by serving vegetarian options more than one to two days a week. Serving a vegan entrée at least one day a week would also add points. The last time Milwaukee Public Schools appeared on the School Lunch Report Card was in 2007 when it earned a C- (72). Five years later, the healthfulness of the district’s school lunches has declined. Vegetarian entrées are only served once or twice a week, and no vegan entrées are available. Healthy vegetable side dishes are only served four days a week, although fresh fruit is available daily. Nondairy beverages are available daily at no extra cost to students. Milwaukee’s cafeterias and menus do not offer education on the benefits of a plant-based diet, but the school system has tried to farm-to-school program. Milwaukee could improve its grade by serving vegetarian entrées more frequently, serving at least one vegan entrée, offering daily vegetable side dishes, and providing nutrition education. More school districts earned an A+ on PCRM’s 2012 School Lunch Report Card than in previous years, and no district earned an F in 2012. Overall, the average grade improved five percentage points, from a C+ (78.7) in 2008, to a B (84.4) in 2012. It’s clear that food service professionals are making an effort to provide students more healthful lunches. The Healthy, Hunger-Free Kids Act of 2010 is a great starting point for lowering the fat in school lunches and adding more fruits, vegetables, and whole grains. But to fight the childhood obesity epidemic, schools should go beyond these steps by serving more low-fat vegan entrées, eliminating processed meats, and educating children on the benefits of a plant-based diet.